Hats off to DK. They always manage to go that extra mile with their movie tie-in books. 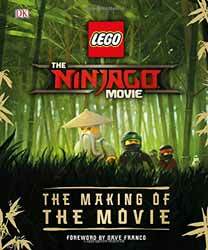 The company is publishing a number of books to coincide with LEGO: The Ninjago Movie, but this Making Of... release has to be about the most interesting. This is a book that will appeal to older readers who not only enjoyed the film, but are also interested in film making in general. It walks us through the process of the production, exploring characters, locations and vehicles. It's packed to bursting with tiny details and facts you may have missed when watching the movie. It's perfect to dip in and out of as well as read from cover to cover. A perfect accompaniment to the movie.